Dr. Kumudini Dharmadasa is a lecturer at the Discipline of Mathematics, School of Physical Science. Her broad area of interest is Pure Mathematics in which she teaches from year 1 to year 4 levels. Her main field of research is the Theory of Representations. She is also committed to many community engagement activities which involves the mathematics education at school level: (i) catering for the Gifted; (ii) Pre-tertiary maths education; (iii) Nurturing maths talent of the educators responsible for the Gifted. 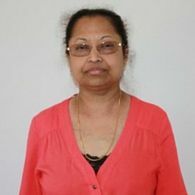 Kumudini obtained her Masters Degree in Mathematics at the University of Ottawa, Canada and the PhD at the University of Adelaide, South Australia. She was a lecturer at the University of Kelaniya prior to this. She joined the University of Tasmania as a tutor, and is now a lecturer in Mathematics. Kumudini is regularly involved in organising community engagement projects and schemes which enhances maths education of pre-tertiary students and teachers in Tasmania. Kumudini is also interested in research which aims at seeking strategies which enhance teaching methods for (i) gifted students in mathematics, (ii) pre-tertiary - tertiary transition, (iii) educating teachers responsible for the gifted students in mathematics. Kumudini's research aligns with the University's research theme of Data, Knowledge and Decisions. One fo the aims of her research is to use MODIS satellite data to obtain 'Change Detection Algorithms' which can predict whether a change is occurring, for instance, in vegetation in a particular part of the world. This involves (mainly) using analytical methods in Stochastic Processes and Fourier Analysis. Her main research theme is The Theory of Representations, which is a Pure Mathematics area. Assessment Standards In Undergraduate Mathematics – Part 2: Kumudini has joined the Monash University team working on the project 'Assessment Standards In Undergraduate Mathematics – Part 2'. This was a part of the national project Maths Assess led by Universities of Monash, Melbourne and Western Sydney. The main project aimed at delivering mathematics assessment standards and a system of rubrics that clearly identify the levels of standards which are applicable for all tertiary institutions. The TEMPEST project (Advisory Group): This is a national project targeting teachers of mathematics K-12, and including the VET sector. It aims to build the capacity of teachers to engage and inspire students through increased knowledge and pedagogical skill. The project will support professional Mathematics teacher development with aid of the national framework for the creation, implementation, and evaluation of quality professional learning (PL) programs and resources available through the AAMT's Portal. Project (2015): 'Essential Algebra Skills Workshop for Tasmanian pre-tertiary students'. The project consists of four tutorial sessions for all Tasmanian students studying pre-tertiary maths unit Maths Methods. The aim is to enhance their fundamental algebraic skills which are very necessary to obtain high scores in pre-tertiary and tertiary mathematics.